Part One: Tracking REDD+ Finance: Separating The Payers From The Posers provides an overview of the project and laysout its objectives. Part Two: REDD Funding: The Horror Story That Isn’t examines the cumbersome accounting behind international aid in general and REDD finance in particular. Part Three: Germany Beats Fast Start Finance But Sees Need For More Scale reviews the results of Germany’s Fast Start Finance period and reasons why they failed to meet their REDD+ commitment targets but succeeded in other areas. Part Four: REDD+ Finance Leaves Pilot Projects In Limbo tells the story of a Ghanaian businessman seeking to launch a pilot project but is struggling to find funding from both international donors and private investors. Part Five: The World Bank And The UN-REDD: Big Names, Narrow Focus provides a detailed overview of the biggest funding efforts of REDD+ as well as their interactions with each other. Part Six: The Congo Basin Forest Fund Steps Up For REDD+ Piloting in DRC describes how the Congo Basin Forest Fund functions, who are the funders and lessons learned. Part Seven: Brazil, Indonesia, And DRC Cooperate On Deforestation, See Future In REDD takes a high-level view of the impact of multilateral financing efforts on Brazil, Indonesia, and the Democratic Republic of Congo to date, and examines the prospects for REDD moving forward. Brazil and Indonesia have slashed deforestation rates in the last few years, in part with the help of international donors, led by Norway. Such efforts have succeeded without a formal REDD mechanism, but both countries and the DRC are preparing to implement REDD+ programs for long-term sustainability and protection of their forests. 14 December 2012 | Brazil recently announced its lowest rate of deforestation since recordings began roughly 25 years ago, and the rainforest nations of Indonesia and the Democratic Republic of Congo (DRC) say they, too, have slowed deforestation rates recently. All three countries achieved their results with support from Norway – which is funding Brazil and Indonesia to the tune of $1 billion each and is scaling up support for deforestation efforts in the DRC. Such bilateral funding efforts are targeted both at large-scale conservation and REDD pilot projects, and they have so far proven to be the most effective international mechanisms for combating deforestation, according to preliminary findings from REDDX, Forest Trends’ REDD+ Expenditures Tracking Project. Donor-country largesse, however, has its limits, and all three countries hope that REDD can bring private-sector funding into the equation. Determining how institution type impacts the rate at which funds are disbursed is a key question that the REDD+ Expenditures Tracking Project seeks to shed light on. The project is in its early days, but over the course of four years, aims to inform governments on how finances flow from donor to recipient countries. Transparent financial flows will be fundamental as more forest nations, like Brazil, Indonesia and the Democratic Republic of Congo, look to REDD+ as a mechanism to fight climate change and curb deforestation, All three countries hope to use REDD to push deforestation rates down even further or at least keep them down. 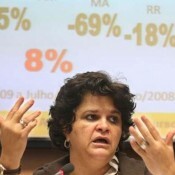 Brazilian Environment Minister Izabella Teixeira chaired the event, and said that REDD+ can address both climate change and biodiversity loss. She added, however, that Brazil still wants REDD payments flowing to the government – as the Norwegian money has – rather than to individual offset projects, as many project developers want. “We need something new to fight climate change and protect the forests and development,” she said. Greg Fishbein of The Nature Conservancy (TNC) said that REDD could bring not only private-sector money but private-sector engagement in general, and said he sees the growing trend of well-known companies aiming to green their supply chains as an encouraging sign. For REDD to attract the kind of resources that will make it possible to scale up, however, he said more pilot projects are necessary. “We need to deliver real results that are measureable in order to persuade the parliaments and taxpayers and corporations of the world to invest more deeply in REDD,” he said. NGOs like TNC can play several supportive roles to ensure this happens, according to Fishbein. TNC invests in sub-national programs – gradually scaled up to reach national level-that demonstrates low-carbon models and how to better use degraded land. For instance, TNC’s forestry work in the southern Brazilian state of Para aims to reduce the deforestation level to zero. The municipality model will serve as a model for the entire state and the national government will draw on its lessons learned when crafting their program. NGOs also assist in implementing policies put into place by governments. Moving to a sustainable model is fundamental in order for a country to have economic growth while protecting its natural capital, he says. “Climate is a problem that exists because of the way we produce food and fuels. And the answer to dealing with climate is about investing in more efficient ways in producing food and fuel that will give us both growth and the possibility of reduction,” says Heller, Executive Director of the Climate Policy Initiative. The byproducts of development are destroying ecosystems globally, he says. And while the increasing pace of growth in developing countries is good in terms of poverty alleviation, it’s also speeding up the rate of environmental degradation. Heller believes high-production agriculture can help by increasing productivity on every piece of land, which will cause less land to be used for the same amount of productivity. This also means it will preserve valued ecosystems along the way. He uses the example of raising cattle in northern Brazil. Cattle pastures occupy 200 million hectares of land. Studies from the agricultural sector have said the same productivity levels can be met with half of that. By doubling the number of cows per hectare, Brazil can remove one of the leading drivers of deforestation virtually overnight. In order for this transition to high-production agriculture to take place, government policies and investments must be made accordingly. REDD+ could help countries make this transition from the old paradigm. Indonesia, which reduced deforestation significantly in the last year, has signed a letter of intent with Norway to establish a REDD+ program. After meeting with Brazil to learn about their REDD+ strategies, Indonesia developed a plan of their own comprising of several phases. The first phase focuses on preparation and development of a REDD+ national strategy. Various concerns about the process are addressed. It then moves to designing a funding instrument and establishing MRV reporting. A priority of Indonesia’s REDD program will be to utilize degraded land. A REDD+ agency hasn’t been established in Indonesia, although discussions are underway. They plan to launch funding and MRV next year. After all this has been put into place, Indonesia will be ready for a REDD program. Central Kalimantan province, on Borneo island, was chosen as the spot for the pilot project. Brazil and Indonesia are also experiencing substantial progress in their subnational programs. In Aceh Province, Indonesia, the provincial government has had success in establishing a logging moratorium to curb illegal logging while building REDD+ agencies to address related issues and designing legislation to approve REDD+ projects, although tapping into adequate finance has been a struggle for Aceh. The Brazilian states of Acre and Mato Grosso have REDD+ programs in the works. While the dramatic drop in deforestation in Mato Grosso is due in large part to changes in cattle ranching techniques, a REDD+ program is being developed to assist the state in keeping those rates low. It’s in the early stages right now but a draft of the state’s REDD+ law would include actions for sustainable forest management and the increase of forest carbon stocks. While finance for REDD+ in Acre has been slow to finalize, the state has reduced deforestation by 60% from 1996-2005 and was one of two states selected to participate in California’s cap-and-trade program. The DRC is seeing movement in the REDD space as well. Their national REDD+ strategy is entering the second phase of investments. The DRC’s Minister of Environment, Bavon Elima, also attended the Doha side event. He credited the country’s partnership with Brazil as a primary reason of their success. The partnership focuses on threes areas: REDD+, forest monitoring and forest management. As a result of this partnership, the DRC has had access to information and an advanced monitoring system that will properly monitor deforestation and degradation in their forests. The Minister also says the two nations will soon sign a MoU (Memorandum of Understanding) which will help foster their collaboration on deforestation. Kelli Barrett is an editorial assistant at Ecosystem Marketplace. She can be reached at kbarrett@ecosystemmarketplace.com.